What to do when Multy APP shows "Unable to Activate Multy"? When the Multy App shows Unable to Activate Multy during installation, two options are provided for the user to continue the installation. One is Try Again and the other one is Reset Multy. Please follow the steps shown below to solve the problem. 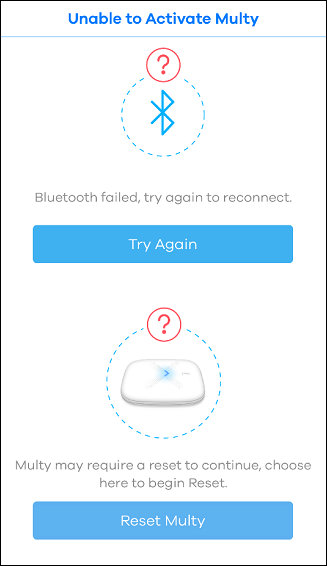 Step 1: Reactivate the Bluetooth of your mobile device and tap the "Try Again" button. PS. For Android phone, clearing the Bluetooth cache might be able to solve the problem. Please refer to the article How to clear Bluetooth cache in my Android phone? Step 2: If the problem still exists after Step 1, please reboot your mobile device and try it again. Step 3: If the problem still exists after Step 2, please try the "Reset Multy" button. Step 4: If the problem still exists after trying all the steps, please try to install your Multy through Web GUI. Please refer to the article How to install Multy Plus (WSQ60) via Web GUI?